I have been using oil to get rid of dark spots over years and have already written a post on this method, you can read it here. Using oil for getting rid of dark spots us not only effective but also most natural way. 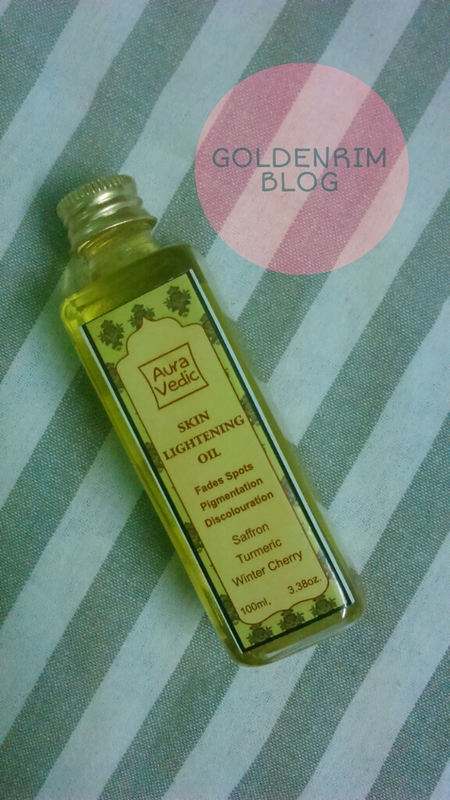 Today's review is about a skin lightening oil which claims to reduce dark spots. Let's see if it lives upto it's claims or not. This powerful skin oil provides the purest, most natural and effective way of reducing dark spots & pigmentation, delivering essential nutrients into your skin’s upper layers. Revealing lighter, brighter, radiant and youthful looking skin. Usage : Gently massage every morning & night on clean skin using upward circular movements. I have used it only at night. 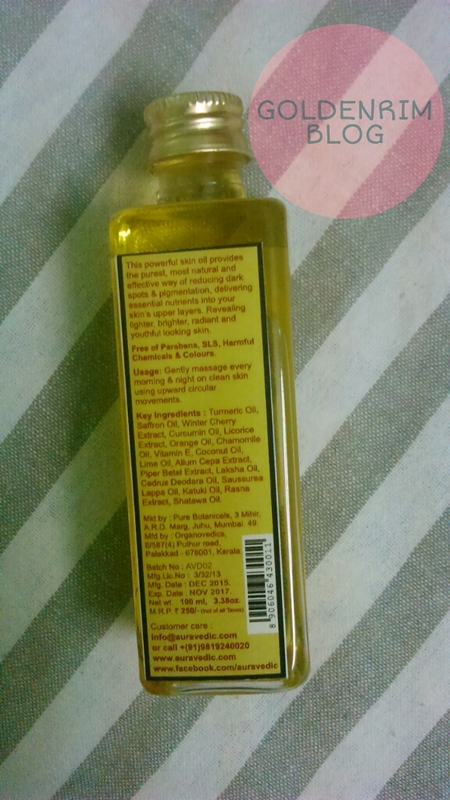 Key Ingredients : Turmeric Oil, Saffron Oil, Winter Cherry Extract, Curcumin Oil, Licorice Extract, Orange Oil, Chamomile Oil, Vitamin E, Coconut Oil, Lime Oil, Alium Cepa Extract, Piper Betel Extract, Laksha Oil, Cedrus Deodara Oil, Saussurea Lappa Oil, Katuki Oil, Rasna Extract, Shatawa Oil. Firstly, let's talk about the packaging, it is a plastic bottle with a plastic nozzle and metallic screw top. The packaging makes it difficult to dispense the product and dispenses more than required amount. It would be great if it had a drip nozzle so that oil could be dispensed drop by drop. The fragrance of the oil is strong citrusy which maybe bothersome to some people. If applied it in small quantity the fragrance doesn't feel strong nor does it linger. Now coming to the usage I applied the oil at night before bed and left overnight. The oil is very lightweight and is not at all sticky or greasy. I used it on my almost faded acne scars and it has helped some of them disappear. I am also using it on pigmentation patch below my lower lip and it is showing slow effects. It's inevitable since natural products take time and patience for results. But the results are ever lasting. The oil is very effective in getting rid of acne spots, dark spots and pigmentation. But if you have very dark spots be patient it will take some time to reduce them but they will be reduced for sure. Some may find fragrance bothering but since the product lives upto it's claims I have no complaints about it. Price and Shelf life - 250 INR for 100 ml with a shelf life of 2 years. Yes I would totally recommend the Auravedic Skin Lightening Oil for its effectiveness and budget friendliness. Plus it's the most natural way of getting rid of dark spots and skin related problems. Do try once if you suffer from dark spots and am sure you won't be disappointed. 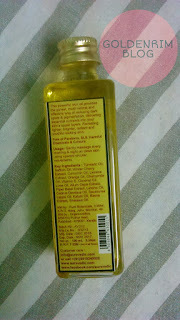 I will surely repurchase this product for pigmentation as I have been practicing oil for dark spots over the years.